The MACD indicator, which stands for moving average convergence/divergence, was invented by Gerald Appel in the late 1970s. The purpose of the MACD indicator is to show changes in the strength, momentum, and direction of the current market. In 1986, Thomas Aspray added the bar graph or “histogram” to the indicator, showing divergence between the MACD and the signal, in an effort to anticipate MACD crossovers. This became the industry standard for technical traders using the MACD indicator. Note: Used correctly, the MACD indicator can be very useful for spotting certain high probability trading setups. It has been the most useful lagging indicator in several trading systems that I have used. The default MACD indicator in MetaTrader 4 (MT4), however, does not use Appel and Aspray’s traditional formula. This can be confusing to traders, especially if they’ve come to the Forex market after trading other markets. Fortunately for us, this is an easy fix. Today, I’m going to show you how to get the best MACD indicator for MT4, and why I believe you should use it if you’re planning to trade any MACD setups. In the image below, there are two versions of the MACD indicator. The top indicator window is the custom MACD True indicator, which displays the indicator in the standard way. The MACD line (blue) is the difference between the 12-period EMA (exponential moving average) and the 26-period EMA. The average or signal line (red) is a 9-period EMA of the MACD line. The bar graph or “histogram” shows the divergence of these two lines. Now look at the bottom indicator window, which is the default MACD indicator for MT4. Notice that only a bar graph and red line are displayed. The default indicator displays the traditional MACD line as a bar graph. The signal line is displayed normally, but there is no bar graph or “histogram” showing the divergence between the MACD and the signal line. I hesitate to say that this is incorrect because an indicator can display whatever you would like it to display. I will say that there are some obvious disadvantages for technical traders that would like to use the default MT4 indicator for trading MACD divergence. Again, take a look at the image above. I marked the bullish divergence with green lines and the bearish divergence with red lines. Notice, in the first bullish example, that the MACD displayed on both indicators showed momentum slowing (double bottom) while price continued lower. This is a form of divergence that can be traded using either indicator. However, the next four examples are traditional MACD “histogram” divergence, and can only be traded using the custom indicator. This is why I believe that the MACD True indicator is the best MACD indicator for MetaTrader 4 (MT4). You can see, just from this one chart, how useful traditional MACD divergence trading can be. Download and extract the custom MACD True indicator. Drag the MACD True indicator onto your chart. The MACD indicator can be one of the most powerful lagging indicators that a technical trader can use if you know how to use it correctly. It’s one of the main components in many profitable trading strategies, and it’s effective in every market. Although the default MACD indicator in MT4 can still be useful, I believe the custom MACD True indicator is the best MACD indicator for MetaTrader 4 (MT4). If you found this custom indicator to be useful as well, please share this article with other traders. I have traded on my demo MACD indicator below zero, but i have lost some trade. Is it adviceble to trade MACD under zero? Thanks for the comment! It’s inevitable that you will lose some trades. Even the pros lose trades often. The goal is to either have more winning trades or to make more on your winning trades than you lose on your losing trades or a combination of the two. It is certainly okay to trade when the MACD is below zero, but like I mention in my article about trading MACD divergence, you shouldn’t trade MACD strategies when the indicator is chopping back and forth across zero. The MACD indicator, at least as far a divergence is concerned, works better when the market is trending. Hope that helps you. Good luck! Here I am learning forex trading and I found that the MT4 MACD is not the one used in video tutorials on youtube. So annoying. MT4 designers should be shot for this. Thanks for providing the correct one. Yeah. It’s annoying, but at least there are plenty of custom indicators to choose from. I’ve traded on some platforms that don’t have the right MACD indicator, and there’s no way to change it. I’m glad you found this useful. Thanks for commenting. 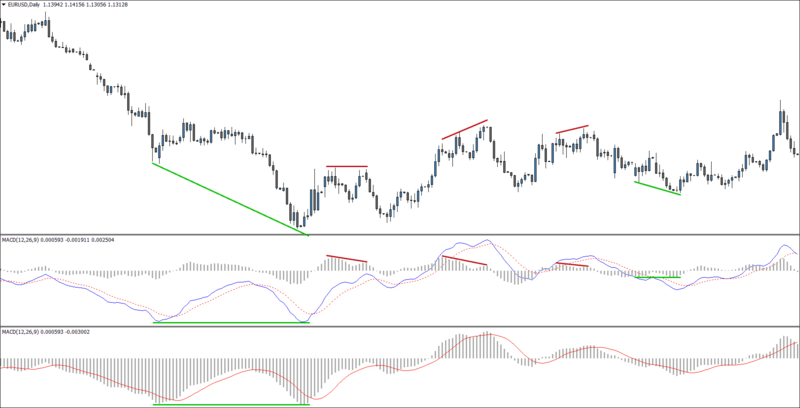 Did you download the MACD True custom indicator and install it correctly? If you have and your MACD line is not showing up, you may need to change the color of it in the properties of the indicator. In other words, you may not be able to see the MACD line because it’s the same color as your chart background. Let me know if you got if figured out or if you need more help. Is it difficult to program the actual divergence lines in this indicator to show up in the charts? I have no idea, Andrew. There are some indicators out there that already do it, though. I don’t like any of the ones that I’ve tried so far because they end up plotting lots of divergences that I wouldn’t consider to be good enough to trade. The charts just get cluttered. I think it’s pretty easy to spot regular and hidden divergence after you’ve practiced for a while. It’s also helpful to learn to spot divergence unassisted in case you decide to use another trading platform in the future. Hi Chris, don t know how to thank you enough,imagine using a fake MACD for over 5 years,your article is simply superb,keep it up man. No problem. I use the MACD all the time, so it’s a must to have a correct one. I knew this would be useful to some of you as well. I’m actually surprised it hasn’t gotten more traction, but I’m glad you found it useful. Thank you for the great information that you provided. it seems like my MACD True indicator doesn’t load into MT5 terminal. As the title to this blog post states, this indicator is made for MT4. If you want to use it in MT5, you’ll have to find a coder to adapt it for that platform. I’ve downloaded the zip, extracted it and placed MACD True.mq4 and placed it into the indicators folder. When I restart MT4 a file called MACD True.ex4 has been created in the indicators folder but MACD True is visible in neither the list of indicators under the insert/indicator/oscillator menu nor in the Navigator menu. Do I need to change something to make MT4 “see” MACD True? I just downloaded and installed this on the latest build of MT4. It works. MACD True should show up next to your regular MACD indicator (not in the oscillators subfolder). If you don’t see it, make sure you’re installing the indicator into the correct folder. With MT4 open, click “File” in the upper-left corner, then click “Open Data Folder,” then double-click the “MQL4” folder, and then the “Indicators” folder. Put the MACD True indicator there. Keep in mind that this indicator is for the regular MT4 installation. You cannot use custom indicators with the mobile MT4 app. This will also not work on MT5. Hey, zicco. Unfortunately, you can’t use custom indicators with the mobile version of MT4. If you’re going to take trading seriously, you really need to be doing it on a desktop or laptop at the very least anyway. You simply can’t get the same depth of analysis and functionality from a mobile app. You can get really cheap used and refurbished laptops on eBay if you need one. I bought a brand new touchscreen laptop last year for about $300. The mobile app is useful for checking your positions and even getting out quickly in the case of an emergency new event or something similar while you’re out running errands or whatever. However, your trading decisions should be made using the best tools available to you. I’m not saying that MetaTrader 4 is the best tool available to you, but the desktop version is way better than the app. Hi Thanks for the real MACD indicator. Do you have the line drawing tool you used in your illustration? mt4 doesn’t have the short line tool option. I’m glad you found this useful. 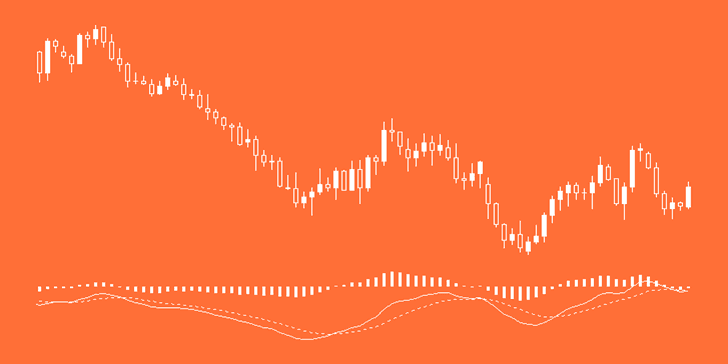 The lines in the illustration above were drawn by me in a photo editing software to illustrate the differences between the MACD signals you get from the stock MT4 MACD indicator and a traditional MACD indicator, like the one you can download from this page. There are MACD indicators out there that will draw divergence on the screen for you, though, if that’s what you’re looking for. I don’t use them, because I can spot the divergence just fine with my eyes by now, and all the indicators that I tried in the past drew lines on patterns that I wouldn’t consider to be true divergence (at least not in the correct context of the trend). They just ended up cluttering my charts more than necessary, and I hate cluttered charts. If you do use one of those auto divergence indicators, my advice is that you compare the MACD lines it draws with the MACD indicator you can download from this page or one like it (traditional MACD). Chris: I am a TOS user, and have zero knowledge about MT4 codes. I have seem a Youtube webinar using MT4 MACD(9, 26, 1). When I do this in TOS coding, the histogram goes to zero, because using smooth length 1, the difference between MA9 and MA26, the value line equals to its MA1. I was confused for sometime. Since you studied the MT4 MACD, Would you please show me the MT4 codes for MACD. I suspect the MACD(9,26,1) only shows the Value line and the average of the value line. The Histogram in your MACD True is not touched in MT4 MACD codes. To verify that, may you please send me the MT4 MACD codes. Many thanks. I’ve never used TOS. The MACD True indicator matches up with traditional MACD indicators on other trusted platform. If you need to see the code of an indicator, simply download a free MT4 platform and use the MetaEditor to view the code. does this indicator works in all time frames? MACD as an mt4 indicator really explained well. Thank you for sharing with us. Thank you so much Chris, that was exactly what I was looking for. No problem, Larry. Glad I could help you! I want macd indicator. I request for your Organization. You can download this indicator with the link on this page. Can you add this to trading view? Trading View already has a traditional MACD indicator, plus many other MACD variants. I also didn’t create this indicator. I’m just sharing it. Hi…also, what does the histogram represent in this version of the MACD? As I mentioned in the article, the histogram in this indicator has the same functional as a traditional MACD histogram. That is to say, it represents divergence between the MACD line and the signal line. That is why I shared it and why I say that this MACD indicator is much better than the default one in MT4.